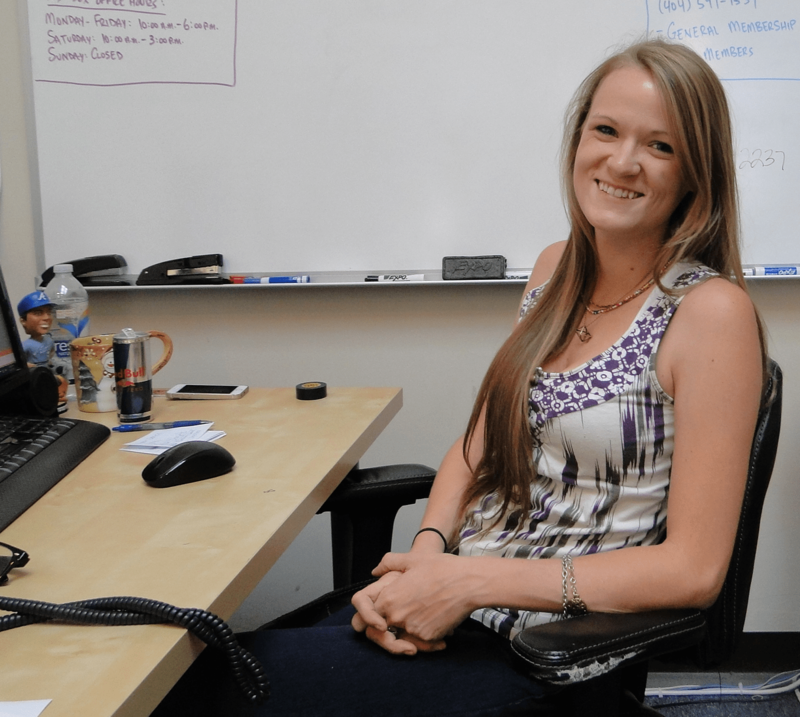 As a customer service representative, Liz O’Brien brings a positive attitude to the office every time she works. We all love to hear her unique laugh when talking to customers on the phone and her outgoing personality continues to help build higher customer satisfaction. Her position includes: helping manage incoming phone calls/customer service emails, participating in printing/distributing the tickets to customers, and working as an on-site box office manager. This Week, TALive had the chance to sit down with Liz and ask her some questions so you guys can get to know her better! TALive: How long have you worked here and what has change the most since you have started? I’ve worked at Ticket Alternative for two years. The size of the company has definitely changed the most. Ticket Alternative was a lot smaller and now we have a lot more part-time employees. I have met a lot of new people over these two years, which is always a good thing! TALive: What moment or day has stood out to you as your favorite? Our Christmas parties are always a good time. It gives us a chance to forget about all the stress, especially since Christmas is right in the middle of the busiest time of the year. Winter is also exciting within our company because we are doing Atlanta Jewish Film Festival and Atlanta Botanical Garden’s holiday lights. However, at the same it is really stressful. The Christmas party gives us a breather from the chaos. I liked how it took place at the venue next door to us, Center Stage, a couple years ago! TALive: What do you enjoy most about your job? I like when I get to work on-site. Being able to work as a box office manager gives us chance to actually work with our customers one-on-one. Overall, working with clients and trying to figure out all the behind the scenes information that you don’t get to experience as the customer is awesome. I get to see the whole process of putting on an event! TALive: Do you remember the funniest phone call you have ever had? Yes, but it was a thankfully a joke my friend pulled on me. It was my second week and I get this phone call around the time R.Kelly was playing at the Fox Theatre. This lady on the phone sounded like an 80-year-old grandma raving about his new album and being so excited for his show. She said to me, “Have you heard the new album? Oh girl you need to check that out.” I started to get nervous and taken back because I didn’t know how to react. She was completely into it and then I hear, “Liz, it’s Andrew.” Somehow my friend pulled off an 80-year-old grandma! I was so embarrassed and people in the office laughed at my reaction. TALive: What has been your favorite TA show? Beck was definitely incredible and neat. One of the most fun shows I have been to, and that is a concert that I can honestly say “I went to Beck.” It is not something that I would typically see at a music festival. I also got to work at Jerry Day, which was a lot of fun because I am huge Jerry Garcia fan. Being able to sell on-site was so exciting for me! TALive: What do you like to do on the weekends? I am your typical show-goer. I try to see as many shows as possible and discover new music over the weekend. I also like to visit my parents in Powder Springs, so I can hangout with them while getting a free home cooked meal. If I have time I like going to Valdosta to see my friends because I went to college there! TALive: What did you want to be when you grew up? I had always wanted to be a high fashion, runway model. In high school I worked with a modeling agency in Marietta, Modeling Images, where I did showroom modeling with Americas Mart. Also, a couple of years ago I did Scad fashion and design modeling. I was a runway and photography model for the fashion and design major for the students. We actually got to work with Ms. Jay from Americas Next Top Model for a month! TALive: If you could eat dinner with three people dead or alive, who would they be? Obviously like I said, Jerry Garcia, that’s a given. Marilyn Monroe, she has a lot of secrets. Last, John Lennon. I feel like there is a lot of mysterious things about these three people that I would have a list of questions to ask them. Like with the whole conspiracy theory with the Beatles and everything Marilyn knew about the assassinations. Jerry’s life in general was mysterious! Take Cover: Tribute Bands Descend Upon The State Theatre in D.C.